Once again, we had Jim from JMR Systems at the LM facility for RapidForm training. This was our second full day of training as per the training schedule set forth by RapidForm and JMR Systems. As we get more and more exposure to the software, its value becomes more apparent. Today we were able to build upon our first day of training and also try different techniques to achieve similar results. You might think this is a waste of time, but in the world of solid modeling, every part is different, and what you need to do with that part has a profound effect on how you model the part. 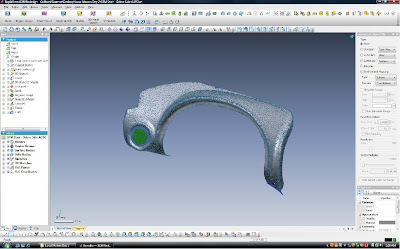 Furthermore, the geometry of a part can affect the way in which you model the part whether it's due to speed, secondary processing etc., not just what the part is going to be used for. At times, a hybrid method is needed to model parts, which is something we also covered today. One of the main things we covered was using a surface modeling approach in comparison to modeling parts as solids as in the first day of training. It was pretty fitting that this was happening today since we were heavily involved in preparing for the surfacing of our first prototype. Having a better knowledge of how the surfaces are created, how the blend and how the reflections on these surfaces play a role in the vehicle design is yet another tool to help us bridge the gap between design and engineering.